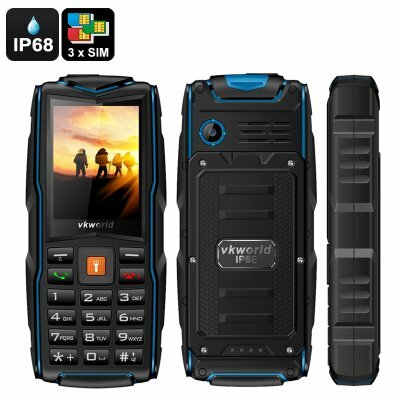 Successfully Added VKWorld New Stone V3 GSM Cell Phone - 3SIM Slots, IP68, Shockproof, FM Radio, Micro SD Slot, Powerbank, Flashlight, Radio (Blue) to your Shopping Cart. For outdoor lovers who want to stay connected, the New Stone V3 rugged phone offers great connectivity and boast powerful outdoor credentials. If you're looking for a phone that is made to last then look no further. The New Stone V3 Rugged phone boasts an |IP68 rating and toughened rubber outer to bring a high degree of protection from water, dirt, and drops. This feature phone has a 2.4-inch display, more than enough for seeing contacts, making calls and composing messages. With 3 SIM card slots, that can all be active at the same time this stunning little cell phone has unrivaled connectivity across the GSM network. You'll be able to have 3 SIM cards from different carriers all present for a wide range of network connections letting you choose the best for your needs. Packing a huge 3000mAh battery there is no shortage of juice and that's a good thing as this rugged phone can double as a power bank letting you recharge other gadgets. A micro SD card slot provides up to 8GB of additional storage so you'll have enough room for days worth of music. Alternatively, you can tune into your favorite FM radio station that will play directly on the phone's speaker and doesn't require the use of headphones. A built-in flashlight means you'll be well equipped if your caught out in the dark and is even enough to read a map by. The New Stone V3 cell phone comes with a 12 months warranty. Brought to you by the leader in electronic devices as well as wholesale rugged phones and cell phone accessories.